Every team needs a "True North"
Did you know Quizzes can be used to generate leads? That's right, you can set up quizzes just like the ones you see all over Facebook and use them to generate leads and drive sales. Interact has a platform that makes it dead simple to build and launch quizzes, with pre-optimized templates you can use to get started in minutes. We have a special offer for Swipe File readers—just use code JIMMY at checkout to get 25% off any plan for life. 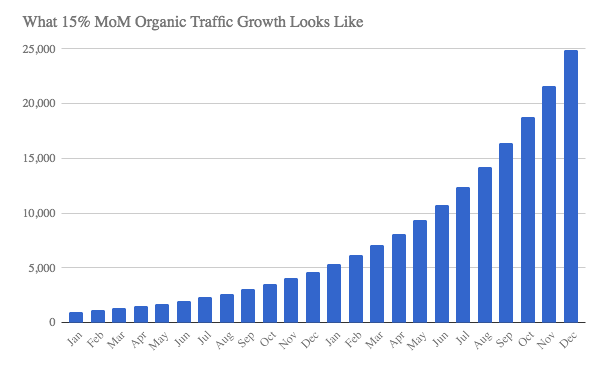 Or, how to grow organic traffic quickly. This is my latest post on the power of compounding returns in content marketing. It includes an exercise that I recommend every content marketer walk through. Another gem from Derek Sivers. 90% students see themselves as more intelligent than the average student. 94% of college professors said they are better-than-average teachers. Ironically, 92% said they are less biased than average, too. The psychology term for this is illusory superiority. Pearls of wisdom from Mr. Money Mustache. If you haven't checked out his site before, I highly recommend that you do. Here's a little snippet that sums up his philosophy. No spoilers. Just click and wait. E-commerce is killing retail jobs fast. Here's a really complete guide to Google Tag Manager. Bonjoro is an insanely cool onboarding tool. There is so much cool art on Instagram. Have you tried Wistia's new tool Soapbox yet? It's quickly becoming an essential for me.